FORTUNE -- For a promotion and entertainment company, Live Nation has had a tough time doing either with much success. Instead, over the last year, it's been battered by regulators, goaded by class action lawyers, sued by rock stars, virtually ignored by analysts, and despised by fans fed up with paying for hidden fees in tickets, only to fork over even more for overpriced T-shirts and beer. Worse still, Live Nation (LYV, Fortune 500) still can't seem to make any money, reporting both unexpectedly large losses and revenue declines earlier this month. Its stock continues to drown in the shallowest pool. And its management acknowledges plenty more challenges ahead, noting that the second half of the year could bring another 15% swoon in concert attendance on top of the 12% decline the industry has already had. So it is somewhat startling that a few well-heeled investors and hedge funds have kept to their bets on a turnaround. Although Greenlight Capital's David Einhorn threw in the towel on Live Nation in April, John Malone's Liberty Media is sticking with it. Others have joined in as well. This August, Farallon Capital Management disclosed it had picked up 900,100 shares of the company, and small-cap value investors at Shapiro Capital, while no fan of Live Nation's successful merger with Ticketmaster earlier this year, continue to hold nearly 8 million shares. Tiger Global Management controls 11.2 million shares, and Stephen Mandel's Lone Pine Capital has bought about 9.6 million shares. It's unclear what these investors see that others don't, although perhaps Live Nation's stock -- which trades at less than a quarter of the price of an average Live Nation concert ticket -- might seem just too cheap to pass up. Corsair Capital Management, another fund that has raised its stake in the ticketing and promotion behemoth, recently opined in an investment letter that Live Nation might finally have its "secular tailwinds at its back," and that it was now trading at an "attractive price for an oligopolistic business with modest capital requirements." However, a bet on Live Nation is in many ways a bet on its ability to execute on a planned expansion overseas. As Live Nation has noted, the North American market is generally unappealing these days. American fans aren't willing to pay what they once did to see many of their favorite acts, there are not a lot of great new venues to tap, and the talent demands an ever-larger cut of the concert pie. "Jay Z doesn't care if he plays in Paris or Denver, but we do," explained Live Nation CEO Michael Rapino during the company's uneven investor day pitch last month. "We make more money in Paris." That is why Live Nation plans to shift its focus to what Rapino describes as "less sophisticated" markets, with the idea of expanding into around 75 live-performance markets overseas. The concert market there is certainly in better shape than the one here at home. Pollstar, which tracks the concert industry, recently reported that top concerts in South America, Australia and Europe continued to gross about what they did last year, about 15% more than they did in the U.S.
Cheaper artists + expensive tickets = international success? According to Live Nation's own data, there is easy money to be made overseas. Fans there are willing to pay about $4 more on average for a ticket than fans in the United States and the artists toiling on stage, on average, are willing to work for at least 19% less of the take. "It is an open world now. This market is on fire on a global basis," said Rapino, adding that Latin America was also hot and that Live Nation was in Dubai "every day of the week...talking to somebody about a deal." But, in his excitement, Live Nation's CEO may not be taking into account that the markets targeted are already being serviced by other large and successful concert promoters and ticket sellers. And those competitors have largely avoided the public relations baggage that has hit Live Nation from a myriad of issues, including cancelled concerts, angry fans, investigations of anti-competitive maneuvers and allegations of unlawful profits. There may be, as Rapino believes, more than 124 million tickets to be sold in places like France, Australia, Belgium, Switzerland, Germany and Spain. But even in countries where Live Nation had years of experience, inroads have been difficult, with Live Nation data showing only about 3% penetration in Spain after a good four years of trying. And so far this year, it's performed worse in overseas markets than it has in the U.S. by some measures. 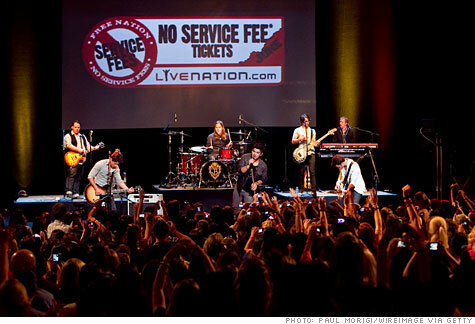 While Live Nation ticket revenue was almost flat in the U.S., it was down about 12% overseas. That's not all. Live Nation has sold fewer tickets internationally so far this year (9.7 million compared with 12.9 million in 2009) even as competitors such as US-based AEG-Live, Germany's Marek Lieberberg, Brazil's T4F, and the UK-s 3A all reported strong gains, according to Pollstar. The concert industry publication's data also showed AEG Live-affiliated companies produced 46 of the top 100 grossing concerts, compared to Live Nation's mere 27. If Live Nation can't make inroads overseas, it will have to play especially nice with fans back at home to rebuild its tarnished image. Already, in an attempt to fill empty arenas, Live Nation has begun to discount more tickets and pitch others as 'free of service fees.' It has also moved to reduce or do away with some fees (such as the absurd payment for printing a ticket at home), tried to make it easier for customers to get the seats they want, and worked to fortify its customer "bill of rights." Rapino says that Live Nation needs to begin treating consumers with the respect they are due. But the sense one gets from hearing Live Nation's management talk during its investors conference is that they still often see their customers as little more than stacks of money ready to slice and dice. Live Nation doesn't believe it should have to reduce what it takes in at a concert to appease fans and fill arenas. Instead, it can force the artist to take the hit, and then dynamically price the tickets so that the front rows pay even more, helping to offset any loss inflicted by the cheapskates that wait around for $10 seats at the rear. The artist's share might suffer, but Live Nation, it seems, can never lose. Like the egotistical, often childish and un-repentant Rock & Roll artists its management arm sometimes represents, Live Nation doesn't take full ownership of its problem, one highlighted by Pollstar editor Gary Bongiovanni when he wrote that the concert industry was, in a sense, killing itself. Fans still want to see live music, he said, despite "piggish, top-tier prices," "add-on fees," the availability of "discounted tickets after they have paid full price" and other "misguided efforts to squeeze the fun out of the experience." Live Nation sees such maneuvers as part of its salvation, while blaming a moribund economy, a yellow press, greedy touring artists and half-witted investors for much of the company's malaise. "From the tone of the questions, I don't think you guys out there really get the message that we are trying to do today," snapped Live Nation Chairman Irving Azoff at one point during the company's investor conference, adding that a few pointed questions about the company's financial difficulties, litigation risk and international rollout made him think that "maybe we've got a bunch of short term investors that need to think longer term." Given Live Nation's recent history and performance, and its difficulty in articulating how it will reach its goals for the future, some investors and fans might think Live Nation should do the same. MySpace: The place for? what, again?